Cliff Tipton of Erda introduces a wild mustang named “Starr” to Alex Jessop. “Horse Culture” runs deep in Tooele County. 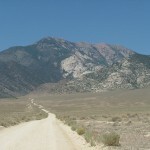 Since the first pioneers homesteaded near Settlement Canyon, horses have been a big part of the community and have contributed to the area’s character. There are even wild horses that can still be seen in the county’s desert valleys, foothills and mountains. Most are wild mustangs from the Onaqui and Cedar Mountain herds. They are managed by the Bureau of Land Management and are a stunning sight when you come across them. There are several areas in the county where you can see wild horses, but because they roam a lot, you will be lucky if you do. Thankfully, I’ve had lucky experiences in our desert where I got close to them. 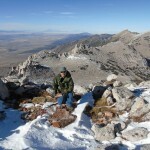 On one occasion, I was hiking Stookey Peak, which is the tallest summit in the Onaqui Mountains west of Rush Valley. 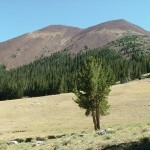 As I approached the 9,020-foot-high summit, the ground started to tremble and about eight horses emerged at a full gallop from around a limestone outcrop. It was terrifying, yet magnificent at the same time. I was also surprised to see the horses on the top of the mountain! Another time, late at night, I was standing next to a waterhole in Skull Valley admiring the Milky Way, when I heard some neighing on the wind. It was faint at first and then it grew louder and I could hear the rumbling of approaching hooves. In minutes, I was surrounded by dozens of wild horses. I stood there like a statue and watched them wade belly deep in the water and frolick. If they knew I was there, they didn’t let on. Such experiences cause a person to gain respect for wild horses and desire to learn more about them. My family has been fortunate to know a quality local resource that offers the chance to get to know wild horses better and to ride and interact with them. That resource is called “Flying T Acres.” The outfit is owned and operated by Cliff and Janet Tipton in Erda. Their mission is to educate the community and their customers about the American mustang. My daughter and I have worked with Cliff and Janet for several years on various projects and we have great respect for them. It’s amazing to watch Janet knock down dozens of miles on an endurance ride, or see Cliff work with a new horse and witness the trust between man and animal build one step at a time. Cliff has been referred to by some as the “Horse Gentler,” because he specializes in gentling wild mustangs. This is no easy task. The animals you see on the range are independent and have no interest in succumbing to the intentions of man. I have watched Cliff turn a monster horse into a great one over time through perseverance and knowledge. He has a rare ability to connect with an animal. He also works with different horse breeds. Many people, some from thousands of miles away, bring their problem horses to Flying T Acres. Cliff assesses the horse and then works toward developing a better working relationship between horse and rider. 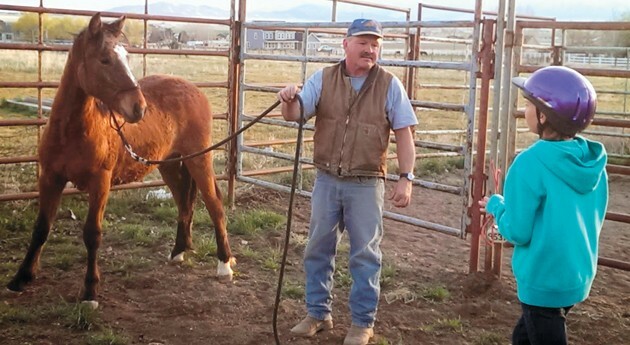 Tooele County residents who own horses are lucky to live close to Flying T Acres, because Cliff is a master when it comes to working with horse and rider, from first-time beginners to experienced horse and rider teams. A great opportunity to see that in person occurs this weekend. The event is a Confidence Building Clinic and it will be held at 9 a.m. Saturday. The address is 4912 Hazel Circle in Erda. The clinic can help anyone who wants to have a better partnership with their horse. Any horse breed is welcome, as are all rider skill levels. Bottom line: if you want to better understand your animal and what makes him/her tick, sign up. Cliff will introduce you to skills and very importantly, some critical “do’s and don’ts” when it comes to dealing with your horse. The morning portion of the clinic will be “in hand” training to introduce horse and rider teams to concepts and approaches that can be utilized to overcome confidence issues, whether it be performing certain tasks or becoming more proficient at tackling obstacles. The afternoon portion of the clinic will be “in saddle,” where concepts learned at a slower pace in the morning will be put into practice. This type of event, with this caliber of trainer, is a rare thing to come by. The cost for a rider/horse team is $50. That is a bargain when you consider most instruction of this sort costs more than that per hour — and this is an all-day clinic. You can also “audit” the event for $10 to see if it’s something you’ll be interested in for the future. Working with the Tiptons and Flying T Acres, you realize it’s not about the money with these people. They genuinely love and care about horses and the best satisfaction for them is when a rider and horse “click” after all the training and adjustments. I’ve seen Cliff get downright giddy and nearly teary-eyed when one of his students makes that connection with a horse. I can tell you from my observations that each horse is different in their appearance, personality and behaviors. It has been quite an experience to get to know different horses over at Flying T Acres and to understand the amount of work required to care for horses on a daily basis. Building proper bonds with your horse and understanding how they think and behave are critical to establishing meaningful communication, building trust and getting the most out of your time spent in the saddle. These skills will pay big dividends for the horse and rider when it comes time to hit the trail for true outdoor adventure. Showing up and riding is one thing, but in the world of horses, the work never stops and cannot be put off because the animals depend on you for their well-being. There are always stalls to clean, water troughs to fill, fences to mend, hooves to clean, tack to maintain, and many other tasks that are required to keep a horse healthy, happy and its living quarters in good order. The last and most important task is obtaining training and then putting in the time necessary to constantly build a stronger bond with your animal. If you own a horse and have the ability to transport it, come on out to the Confidence Building Clinic on Saturday. You will meet some great people and your relationship with your animal will be greatly improved. 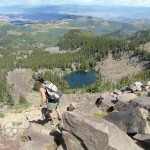 For information call 435-849-4923 or visit their website at www.FlyingTAcres.com. For wild mustang viewing opportunities in our West Desert contact the Bureau of Land Management — Salt Lake District Office at 801-977-4300.